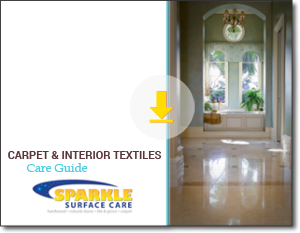 Download our free Carpet and Interior Textiles Care Guide. It’s a great resource full of tips and info. You will want to keep it handy. Your carpet and interior textiles play a fundamental role in your decor, and we want to help you maximize their life and keep them looking their best. We are all about professional cleaning for your carpets, fine rugs, upholstered furniture, sheers, curtains, and other fine surfaces, but just as importantly, we want to make sure our clients are armed with good, sound care information — which is why we are so pleased to offer a wealth of information here on our website, especially this Carpet and Interior Textiles Care Guide. Feel free to pass it around liberally. When it comes to maintaining your carpet, one of the most critical areas of focus is the traffic areas. If ground in soil is not removed on a regular basis, the traffic areas will begin to wear excessively. Dirt is extremely abrasive against the fibers of the carpet as you walk back and forth. The second area of focus, of course, is spot removal. You must react to “danger” spots immediately. Red wine, red beverages, urine, blood, etc. can cause a permanent stain if not treated right away. Listed below are the steps that you must take to properly maintain your carpeting. Copies of specific warranties on your carpet purchase may be available from your carpet retailer. Stain resist warranties can vary from 5 to 20 years. ALL STAIN RESIST WARRANTIES REQUIRE REGULAR CLEANING AND IMMEDIATE SPOT REMOVAL. Vacuum your carpet often — once or twice per week at least. Vacuuming removes the sharp soil that can cut and slice the fiber causing premature wear. Much of this soil is not visible to the eye. Vacuum before the carpet looks soiled. Remove any loose particles such as loose food, leaves, pieces of crayon, bugs, etc. as these items can cause a spot on the carpet. As a general rule, professional cleaning should take place about once per year. For extremely heavy traffic areas, cleaning may be required more often. Proper professional cleaning will not leave a sticky residue behind and can be done as many times per year as needed. MANY STAINS RESIST WARRANTIES REQUIRE PROFESSIONAL CLEANING EVERY 2 YEARS. Professional cleaning removes the damaging soil from the traffic areas that vacuuming has not been able to remove. WARNING: UNINFORMED CARPET CLEANERS MAY VOID THE WARRANTY, BE VERY SELECTIVE WHICH COMPANY YOU HIRE. Immediate spot removal is key to a clean carpet. Great care also must be taken in how spot cleaning is performed. When a carpet is new or has sufficient protector on it, plain tap water will remove many spots. However, for those spots that will not move easily with water, you must use a spot cleaner. Select a spot cleaner that is recommended by the carpet manufacturer or by us. Most spot removers that are purchased over the counter leave too much soap residue and can cause permanent yellowing. Avoid using foam carpet cleaners or any product that is not made specifically for carpet. Apply spot cleaner sparingly to white terry cloth and gently massage the spot, causing it to transfer into the cloth. Never pour spot cleaner directly on carpet. If the product that you are using seems to cause the spot to re-soil after a few weeks, throw the product away and call a truck-mounted steam cleaning company to thoroughly flush the residue out before it has any lasting damaging effects on your carpet such as bleaching, fading, oxidation, delamination, etc. Many spot removers and cleaners supposedly made for carpets and rugs will flat out ruin them, leaving a soapy residue that attracts soil rapidly which you can only remove with a truck mount, sometimes with several cleanings. Even then, the cleaner will change or remove the color of the carpet. For this reason, we only recommend the neutral pH spotter we give you for free, which cleans far better than any you can buy. Just ask for some. For any spot that you are not able to remove and for pet urine or feces, contact us immediately. Rotation – To ensure even wear, your rug should be rotated once a year. Depending on the traffic, the rotation may vary from six months to two years. Vacuuming – Oriental rugs, like most carpeting, should be vacuumed on a regular basis to remove dirt and restore life to the fibers. Be sure not to vacuum the fringe with your beater bar! Use the end of a vacuum hose from a canister vacuum. Padding – A quality pad used under your rug helps protect it from dirt, wear, and slippage. Soak up the excess liquid by blotting with a clean absorbent material. Do not brush or rub the spot. Spot-clean with a mild detergent-white vinegar-water solution. Do not over-wet. Rinse area thoroughly with water and a small amount of vinegar. Avoid wetting the rug’s backing. Allow air-drying. A fan or cool hair dryer can be used to hasten the drying process. For spots that do not come out using these methods, contact us right away. We can remove the spot before it becomes a permanent stain. By far, professional upholstery cleaning and protection is the best possible way to extend the life of your upholstered furniture. Vacuum often to reduce grit that can cause abrasion. Reverse loose cushions weekly for even wear. Protect from the sun. U.V. light can cause deterioration. Keep pets off the furniture. Your pets’ body oils rub off and can be difficult to remove. Use caution with clothing such as blue jeans. Fabric dyes can transfer to upholstered furniture. All upholstered furniture will become soiled through use. Most spills and soil on fabric-protection-treated furniture will clean easily and quickly provided that the proper cleaning procedures are followed. A fabric protection application is not an absolutely impenetrable barrier and improper cleaning methods can damage both the fabric and the treatment. Blot (don’t rub) spills immediately with a clean absorbent cloth while the spill is still fresh. Dried spills are more difficult to remove. Identify the cleaning code (see chart below) for your type of fabric. This is very important to determine the cleaner to use. Always read and follow the instructions on the cleaning agent. Pretest any cleaner on any fabric in a hidden area. Check for color-fastness and fabric compatibility. Keep a small spill small. Work lightly, blotting from center to the edges. “Feather” the edges by dampening edges irregularly and blotting quickly to avoid rings. Quickly dry a cleaned spot using a small fan or blow dryer set on low. W—Spot clean with water-based shampoo or foam upholstery cleaner. Pretest for color loss and fabric compatibility. DO NOT overwet. Call us for professional cleaning for overall soiling. S—Spot clean with a water-free cleaning solvent. Pretest for color loss and fabric compatibility. DO NOT USE WATER! Call us for professional cleaning for overall soiling. WS—Spot clean with upholstery shampoo, foam from a mild detergent, or a mild dry cleaning solvent. Pretest for color loss and fabric compatibility. DO NOT overwet. Call us for professional cleaning for overall soiling. X—Clean only by vacuuming or light brushing with a non-metallic brush. DO NOT use water or dry cleaning solvents. Call us for professional cleaning.